The use of kennel dryers and their maintenance in our Barker Shop. It always seems to happen in waves. Once or twice a year, a pet is injured or even killed in kennel dryers in grooming shops here in the U.S. There's no doubt you have seen these stories on the news and online. They are tragic and unfortunate and should never even happened at all. Rather than avoid this situation, we feel as though we should discuss this subject head on and, hopefully, educate the public on why this occurs, how it can be prevented, and our own position on their use. Detail of the most used kennel dryer in salons. The Edemco F500 double kennel dryer. Kennel dryers, or cage dryers as they are often called, are simply a large cage in which a blower is located on one side and blows air through the cage and over and around the dog to help in the drying process. Every day, thousands of grooming salons around the world use this equipment with no problem whatsoever. The key to the proper use and safety of these machines is maintenance and observation. Attached to the front of many of the blowers within the cage is a heating element very similar to those seen in an electric kettle or hair dryer. The temperature is set on the kennel control panel along with the timer and the blower turns on along with the heating element. The air passes from the blower, across the heating element, and into the cage, giving the affect much like a hairdryer for people. The problem comes in when these machines are not maintained regularly. If not kept clean of loose fur, the element can catch fire. The vast majority of shops use their dryers with this element with no problems at all because they maintain their equipment properly. Other shops, ours included, go the extra step and completely remove that heating element eliminating even the slightest possibility of an accidental fire. Without the heating element, the blower simply blows room temperature air over the dog to assist in the drying process with the temperature inside reaching a maximum of 85 degrees. With the element in place and un-monitored, temperatures in excess of 100 degrees inside the cage are possible. 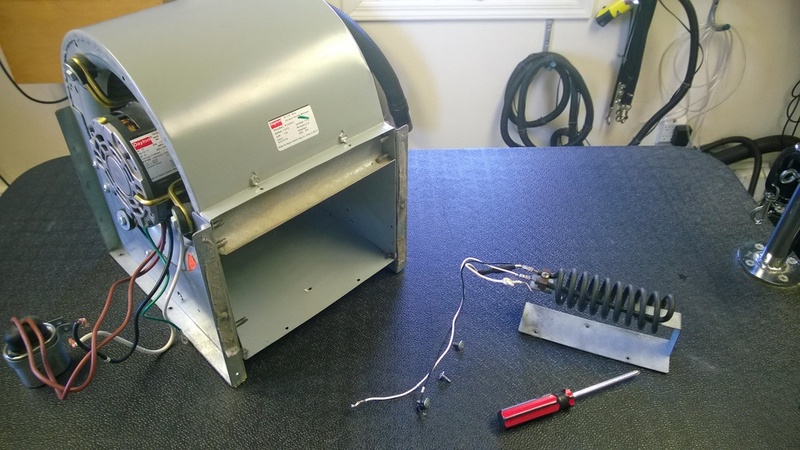 Here you can see the blower motor (left) removed from our kennel dryer. You can also see the heating element completely removed (right). The element bolts to the inside of the blower motor via the three holes on the mounting plate. Close up of the heating element. If excess fur and dander were allowed to accumulate over time on top of it, you can clearly see how easy a fire may be started. This is why we opted to completely remove ours. These dryers must be within eye site so the pets can be observed at all times. At Dog Days, we designed our Barker Shop in a way such that our dryer can be observed easily from any of the three grooming rooms with the use of glass doors and large windows. There is never a time your pet is not being watched in the cage dryer. Also, with observation comes the monitoring of the temperature within the dryer. Our dryer has a digital temperature gauge built onto the outside that clearly displays the room temperature and the inner temperature. Below you will see one such vantage point of observation. The photo details exactly where the groomer is normally standing (at the grooming table) and the clear line of site to the dryer. From this vantage point, please note there is a clean line of sight from our grooming table (bottom left corner of photo) to the kennel dryer. It is also visible from our bathing room and drying room. In 2008, two of my former instructors at Nash Academy were invited onto the Today Show to discuss one of these incidents that had recently occurred. The video below is well worth the time to watch and goes into detail concerning proper use of these dryers. As stated before, these unfortunate accidents should never happen as they are easily preventable. As with any piece of equipment, it needs to be maintained and observed at all times. It's just plain common sense really. Unfortunately, the lack of caution and education on the part of many groomers has now put a black eye on our industry. We feel the key to righting this wrong is openness and education on our part to you, our customers. If you should ever have any concerns or questions regarding these dryers, don't hesitate to reach out to us. Our door is always open. We would even be happy to show you our dryer and the way it is operated and maintained.